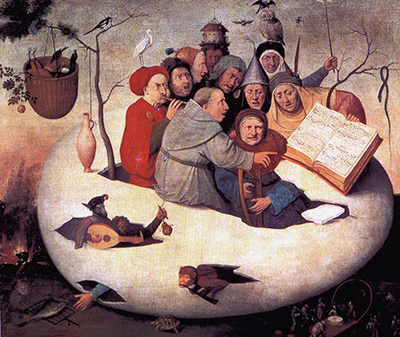 Hieronymus Bosch was a painter of dreams, and nightmares. Instead of depicting nature as we all see it, this was an artist who would create stunning scenes of activity based on religious passages, adding his own imagination and technical ability. The inventiveness of Bosch was to impress art followers across Europe during and beyond his lifetime, but many were uncomfortable with the scary creatures depicted in many of his paintings. The 15th and 16th centuries were far less open to new artistic directions than the art public that we have today are, and so this Netherlandish painter would not follow a smooth path of attaining academic respect for his art works. Further famous Dutch art would be contributed by Vermeer and Rembrandt. A clear contrast can be made between the styles of Bosch and famous artists of that era such as Albrecht Durer, who concentrated on animal depictions, flowers and portrait etchings. Indeed, Durer, more of a true Renaissance artist in style, was to imply that Bosch was a "painter of dreams" in one of his own books. Little was known about the man behind the paintings for several centuries after his career, but what we do now know is that Hieronymus Bosch was to become a significantly respected individual in his local region of 's-Hertogenbosch as a result of his work. He was to rise to the elite ranks of social circles after being backed by several notable patrons. 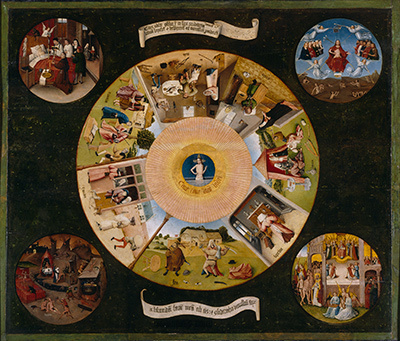 We can conclude as to Bosch's detailed knowledge of the Bible and Christian beliefs as well as religious symbolism, due to the content found in his paintings. There is therefore considerable thought that has gone into his art, rather than wild fantasies being outputted onto canvas. The grotesque creatures of Bosch's art were to encourage others in future generations, with Dutchman Pieter Bruegel and Spaniard Francisco de Goya among those who used similar themes in their own artistic content. There have been wide ranging opinions on Bosch from a variety of sources over recent centuries but it is generally accepted that the artist aimed to use his art to teach moral and spiritual lessons to others. This was common at that time within Northern Renaissance art and literature, see also Albrecht Durer. Typical of artists from the 15th and 16th centuries, there are not that many art works remaining from Bosch's career, with many other of those that have been confidently attributed to him having fallen into considerable disrepair. It is also likely that Hieronymus was not the most productive of artists anyway, and would put a lot of time into several large scale triptych altarpieces. Compare that to the likes of Raphael, da Vinci and Michelangelo Buonarroti who produced endless streams of high quality work over many decades. 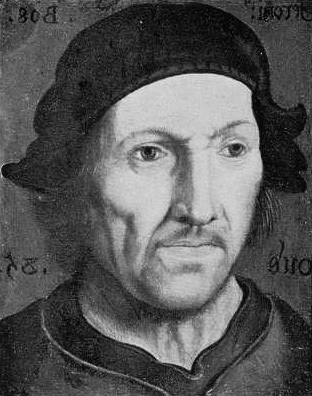 Several members of Hieronymus's family had artistic links, including his father Anthonius van Aken. It is likely that either his father or uncles had taught him to paint, but there is no real evidence to confirm this. The family also had held links to the Illustrious Brotherhood of Our Blessed Lady and this continued with Hieronymus. There are many symbols and themes of religious influence to be found in his work. 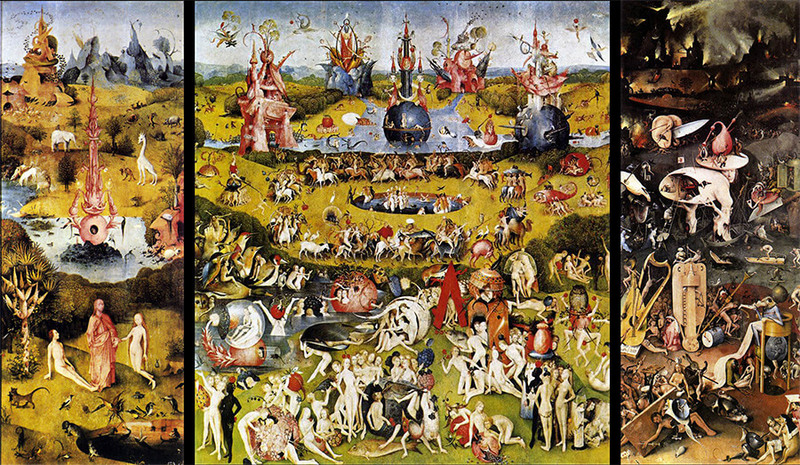 The Garden of Earthly Delights is an oil on oak triptych from between 1490 and 1510, and also Hieronymus Bosch's most famous painting. 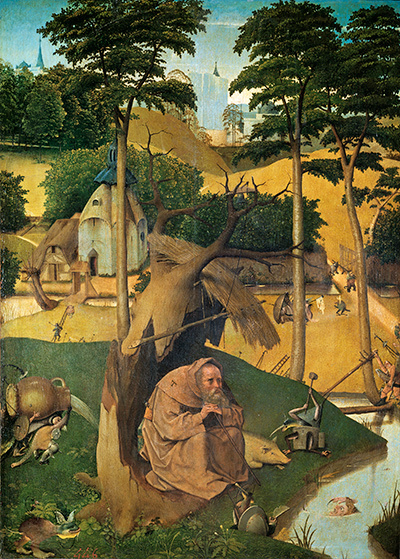 Disclaimer: HieronymusBosch.net is a personal website covering the career of famous Netherlandish painter Hieronymus Bosch, but is in no way an official website for Hieronymus Bosch and HieronymusBosch.net does not claim to be that in any way. The Estate of Hieronymus Bosch and their presence hold all necessary copyrights and licences for all of his paintings and other works. 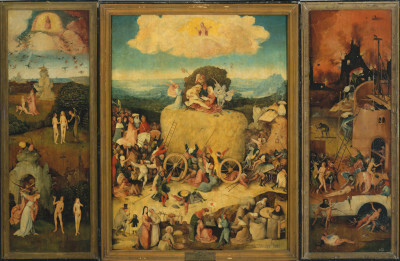 All prints, paintings and photos included in HieronymusBosch.net are provided as an affiliate to Art.com who hold necessary permissions. Art.com pay us small commissions based on any prints or paintings that you buy as a result of using this website.